Written by Dezza, 3 May 2018. 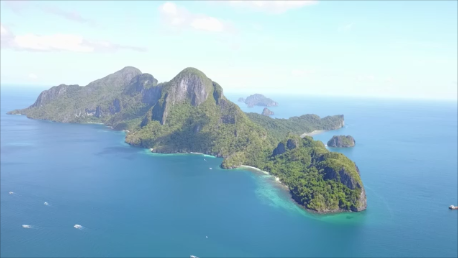 In last week’s blog, I talked about the best 20 places to visit in Palawan. 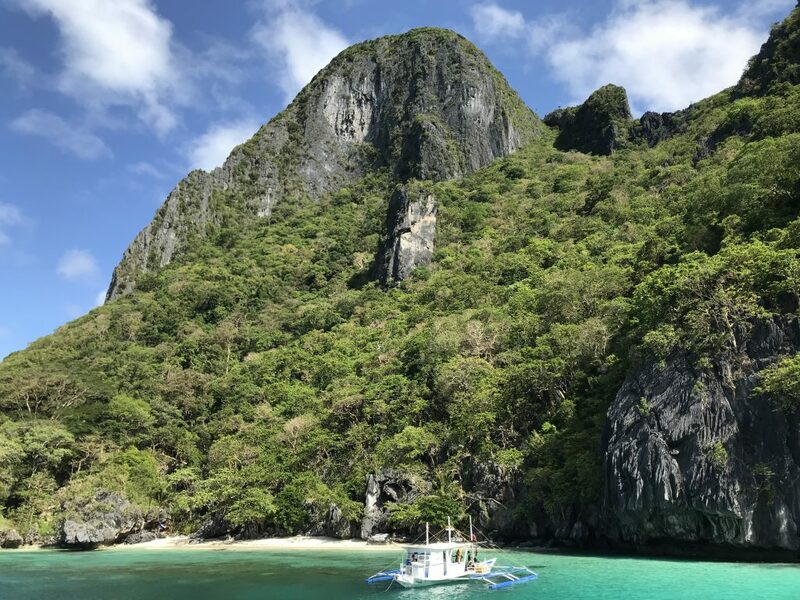 I also mentioned in this blog that one of the best ways to see Palawan is actually under the water, or at the very least, on the water – in a boat. With a total of 1,760 islands making up the province of Palawan, there is plenty of water and copious amounts of marine life including sea turtles, thousands of species of fish and hundreds of species of coral. This makes it one of the best places in the Philippines. 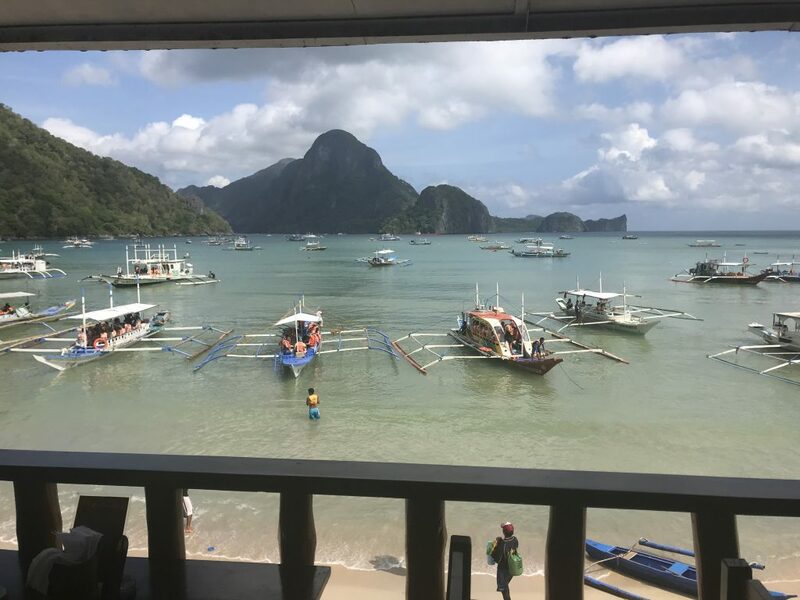 Having lived in the Philippines since 2003, I have been to many Philippines destinations in which scuba diving and snorkelling are considered the best in the world. For some reason, I have not actually gotten around to scuba diving. I have done plenty of snorkelling and swimming but have not really taken the opportunity to go scuba diving. Fortunately for me, I have some good Aussie friends that have a dive resort in El Nido, Palawan, called Submariner Diving Centre. They invited me down to take a look at the resort as well as all of the surrounding areas of El Nido and of course, to go scuba diving. It was an offer too good to refuse. As this was my first time to go scuba diving, I was naturally a little nervous. However, I was also excited at the same time. In the end, any nerves that I had quickly disappeared as the diving instructors made me feel very comfortable with their professionalism and knowledge. Breakfast view from Habibi, the restaurant at Submariner Diving Centre. It’s hard to drag yourself away to go diving! Submariner Diving Center is a PADI 5 Star IDC Resort and is the only five star rated dive resort in Palawan. This certainly provided me with an extra level of comfort being my first time. Submariner Diving Centre offers a number of different diving packages depending on your level of experience. Their packages include everything from fun dives and night dives, open water, and PADI speciality courses, right through to Dive Seafaris that go from El Nido up to Coron. These Seafaris allow you to explore Japanese shipwrecks from World War II over the period of 4 days. As this was my first time to attempt scuba diving it was suggested that I do the discovery dive. El Nido is such a beautiful place it doesn’t really matter where you go because it would be pretty hard to not have a good time and enjoy the beauty of the place. Having completed the health questionnaire the previous evening, the next morning we were measured up for our wetsuits and flippers. From there we took to the boat and headed out to Cadlao Island. First dive stop was here at Pasandigan Cove on Cadlao Island. Postcard perfect views. There was about a dozen of us on the boat and most of us had limited to no diving experience at all. So our first stop was at Pasandigan Cove. After running through the basics of how to use the breathing equipment, the instructors took us into the water in small groups of three to four people. From there, we were given a basic introduction into scuba diving in about 2-3 metres of water. For those that have done scuba diving before you will not what is done at this stage. However, there was one manoeuvre in particular that I failed to pass. This involves recovering your breathing regulator should it accidentally be not from your mouth. The chances of this happening in the water are actually very minimal, however, if this happens, depending on how deep you are, it can prove fatal if you don’t know the correct technique in which to recover. I won’t go into too much detail about how to recover your breathing regulator should it become dislodged, however, the technique involves tipping your body to the right side and swinging your arm around in a roundhouse motion from behind you. This should naturally allow the regulator to be hooked by your arm so you can bring it back to your mouth. This sounds simple enough, however, as I had some slight nasal congestion, this tipping motion caused extreme pain in my ears. I had already tried the equalization techniques on a number of occasions however, I was unable to equalize. Therefore, and rather unfortunately, the instructor advised that I would not be able to continue. This didn’t bother me too much as we were still in Palawan surrounded by incredible blue water, limestone cliffs, and white sand beaches. Things could have been a lot worse. No scuba – no problem! The next stop for the diving was at Dulimucad Island, which is apparently the location for the South African version of survivor series. Everyone else went diving except for me but I wasn’t to be deterred. I simply grabbed a snorkel and did some snorkelling and ended up sitting on the beach enjoying the views and the serenity. This was a very peaceful island with a beautiful golden sand beach with amazing powdery sand. If I ended up being stranded on this island, I don’t think I would mind at all. 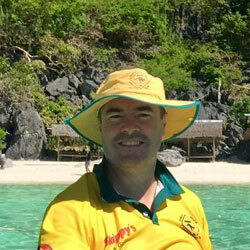 Amazing experience to chill out on this sensational beach and enjoy the sensational views. Our third and final stop was at Paradise beach, located at the Eastern end of Cadlao Island. This area was apparently home to two giant sea turtles who are revered as very popular tourist attractions. After we pulled up, and everyone had jumped in the water, one of the boat crew excitedly pointed to the water. There is one of the sea turtles! Sure enough, swimming gracefully by himself was a giant sea turtle. Luckily we had the drone with us so we sent the drone out to capture some footage of this magnificent creature swimming in his natural environment. This really was a stroke of good fortune for us. After about 20 minutes of enjoying the beautiful surrounds and taking some amazing drone footage, it was time to head back to Submariner Diving Center. 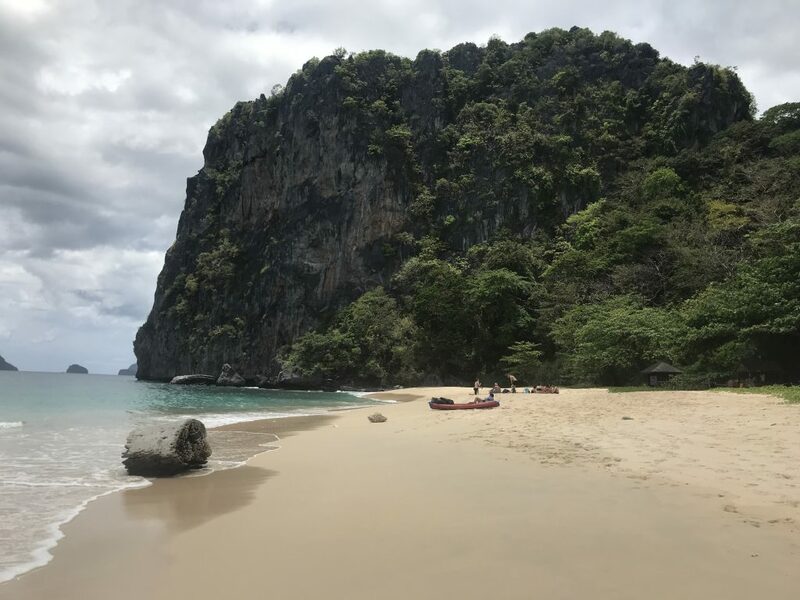 Paradise Beach is in the foreground here on Cadlao Island. Here is where the sea turtles like to chill out. Submariner Diving Center has a great bar called the Eagle’s sports bar in which there are sports on the TV including my favourite, Aussie Rules. There is a wide selection of drinks and cocktails and some great music to get you up and about. To top it all off you have fantastic views across Bacuit Bay. Or, you can choose to sit at the tables out on the sand. Here you can enjoy a shisha or a couple of beers and cocktails and great food. On the second level is the restaurant known as Habibi. Here they serve breakfast, lunch, and dinner. Although the restaurant has a Middle Eastern feel to it, the dishes are not all necessarily Middle Eastern. As the owners of Submariner are Australian there is a good mixture of food on the menu. There is everything from burgers and calamares through to Thai red curry mussels and chicken shawarma. Oh, and the Habibi fries are sensational! Overall, the food is excellent, very well priced, and is a great way to end a day of diving. The service is excellent and the staff are very friendly and accommodating always making you feel welcome. At the time of writing, the accommodation section of Submariner is under renovation. Eventually, however, there will be accommodation available making for a totally complete package of diving, dining, and relaxation. You can check out Tripadvisors rating of Submariner Diving Centre here. If you’re ever in El Nido and are looking to do scuba diving, or even just chill out in general and have a feed and a few drinks, I fully recommend Submariner Diving Centre. G’day! Welcome to deztreks.com, an award winning travel website and blog. My name is Derek but you can call me Dezza. That is how the name Deztreks came about. It’s a combination of my nickname and trekking, which I love doing. I have been living in the Philippines since 2003 and have travelled all over the country. In this website, I will share all of my tips & tricks as well as all the places that are worth visiting in this beautiful and amazing country.